five star hotel with various room type of residence style and hotel style! Ramada Hotel & Suites, opened in May 2007, is a five-star accommodation featuring both residence and hotel type guestrooms. There are 331 guestrooms total with a selection of diverse rooms. They are equipped with individual termperature control and complimentary LAN line for guests with laptops. There is also a pc rental service, breakfast at te 24th floor international buffet, hotel spa and much more. 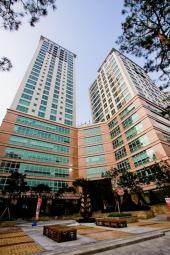 Located in downtown Seoul, many statio are in the vicinity including Seoul station and City Hall station. KTX at Seoul station is great transportation to visit other regions and tourist attractions including Namdaemun Market, Myeongdong, Gwanghwamun, Deoksu Palace and Gyeongbok Palace can be reached by subway, bus or taxi. 7 Luck Casino is also within 10 minute distance, raging with round-the-clock entertainment and more fun awaits at Jeongdong Theater and B-Boy Korea performance center in Seodaemun. Besides Starbucks, Family Mart and GS 25 convenience stores within the hotel, guests can also dine out or shop at famous local restaurants and stores.